profile Associate professor of communication at Kobe City University of Foreign Studies & lecturer of marketing strategy at IUJ. Adam started writing about social media as early as 2005 and is the author of several sns studies including "the antecedents of social networking behavior" and "Twitter usage during the Great Tohoku earthquake." Adam Acar is also the director of Marketing Competition Japan, the first All-English social media focused competition in Japan. Important note: Most of these statements are qualitative in nature. For some statements there’s not enough supporting data. Please read this post with a pinch of salt. In the summer of 2004, a new file sharing platform, named wirehog, was in the works. This platform was not that successful and it gave us a very clear lesson that pretty much noone knows what’s going to happen in the social media business including some names like mr. Zuckerberg, because he was the one who chose to launch wirehog instead of focusing on the core functions of facebook and using the time and money on a failed project. One of the unexpected developments recently taking place is the unstoppable rise of Facebook in Japan. Like many, I predicted that Facebook can’t be the mainstream platform choice in Japan, based on two studies I conducted in our university. We asked if they did not want to use the platform because of the real name (jitsumei) requirement. they said NO. Unlike some people who speculated that Facebook can’t win in Japan because of the real name issue, we found that real name requirement was not a big deal. We asked what their opinion would be if pseudonyms are allowed or if Facebook was changed. Most of the participants said (not all but Id say more than half) that they would not use Facebook no matter what. 1- Facebook means disclosing more info, more frequently and to more people but there are dozens of studies that show Japanese people feel quite uncomfortable disclosing info about themselves to strangers. 2- Facebook means exchanging links, images and messages with a large number of people but Japanese people would feel quite unconfortable with communicating with their close friends and weak connections in the same way. Eventually Facebook took off, but I still dont think that what we said was wrong, it was the change agents that we forgot to put into the equation. Who are change agents? 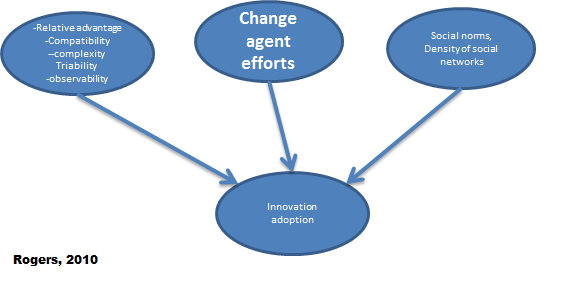 According to Everett Rogers (the theory was originally developed in 1962), Change agents are those who promote a new idea or a new innovation in society. They can be opinion leaders, influential people or people who have stake in the adoption of any new phenomenon. As a scholar who published the first ever study about Facebook and Marketing in 2007 and who’s been studying social media since 2006 I can tell that it is not the design, not security and not functions, if a social network platform wants to succeed, all it has to do is making people believe that other people are using the platform. When our participants said they did not want to use Facebook because it was not secure and it was not good for Japanese people, what they meant was “of course I’d use Facebook if my friends are using it.” However, they never mentioned this, because they did not know why they left Facebook. As the failed focus group studies of the New Coke from the 80’s showed, consumers are pretty bad at verbalizing their thoughts. Long story short, Facebook made Japanese people believe that it was taking off. How? Well, there were not once, not twice, not thrice but at least four incidences that the number of Facebook users increased or decreased more than 500,000 in one day. Let’s hope that It was just a simple glitch in the system. However, Facebook user numbers reported by Facebook, made the impression that Facebook was taking off in Japan. I don’t have any data on this but even though people in Singapore, Hong Kong and Malaysia use Facebook way more than do the Japanese, for some reason, in international startup events I see Japanese startups focusing on Facebook plugins or the Facebook social graph more than the ones from in the Facebook friendly countries I mentioned. Unfortunately, there’s no successful Facebook based startup in Japan but when I wrote that Facebook can’t win in Japan I deeply underestimated the app developers who promoted Facebook by investing on the platform but failing to recognize consumer patterns in their own culture. Although Japan is known to be the exemplar of soft pull marketing, the largest Facebook page and the first page to reach the 100K member milestone was Miyamatsu.net, a company that teaches how to do marketing on Facebook. This is a clear indication that there were at least 100K people in Japan who really wanted Facebook to succeed so that they can be known as experts and they can benefit from Facebook’s success. In the past 2 years, smart phone usage in Japan increased unexpectedly. Although the official numbers indicate the adoption rate about 30%, if you exclude people who are older than 60 (about one quarter of the population), people who live in rural areas and small towns (another quarter of the population) and focus on young professionals and college students, the adoption rate is about 80%. In our university our survey shows that 80% of the students have a smart phone (we are not a private university). Most smart phone operators provided built in Facebook apps on the main screen starting in 2011. Dentsu, Japan’s largest advertising agency signed a special advertising contract in early 2011 which was widely covered in the news and helped Facebook increase its visibility. We were right in everything what we said originally, we just didn’t think that Japanese Facebook users adopt the platform and use it passively. Our last survey (in press) showed that more than 60% of the Japanese Facebook users did not upload any picture or update their statuses in the past 6 months.Additionally according to comscore Japanese users have the lowest engagement in the world.Yes, they use Facebook but they use it passively, this is what I failed to see. The very early adopters of Facebook seemed to be techies from Tokyo as this blog post from early 2011 states that 17 out of 18 people in a tech meeting in Tokyo had Facebook accounts and most of them had more than 200 friends. After the very early adopters of techies, and then marketers, the third group seemed to be college students. I’ve heard that after some company briefings that are open for college students, many students asked each other to be Facebook friends and in order to exchange info about job hunting. This would be unthinkable in Traditional Japan as the only thing common among these students is their sitting in the same briefing room for 1 hour but nothing else. Anyways, after the students who adopted Facebook mostly because of the job hunting reasons (in March 2011 we conducted a content analysis and we found that only 2 among top 100 Japanese corporations had a Facebook page and one of the pages was a recruitment page. Even today, P&G, the world’s largest FMCG brand, had more than 10,000 fans on its recruitment site , more than many of its other brands in Japan). After the early adopting college students mostly from good schools in big cities, there was an impression that those who are modern and cool were using Facebook and those who were conservative using Mixi as can be seen in this cartoon. This also helped Facebook gain the “cool” image. 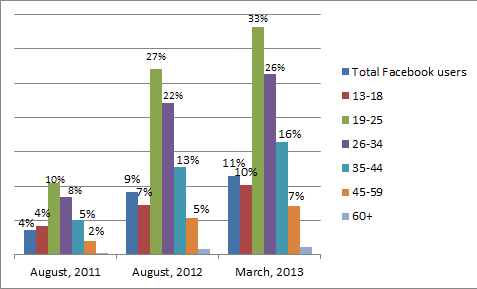 As the graph illustrates Facebook had the highest gains and highest population penetration among the 19-25 age group. The percentages represent the number of Facebook users in each age group divided by their representation in the total population. You can see the detailed info in appendixes. 2-The design doesn’t matter that much. Google+’s interface got great reviews from many different tech bloggers. Also whenever Facebook changes its interface the users threaten to quit but eventually people stick around because what matters is not the interface design but whether other people are using the network or not. Let me give this example: would you want to hang out at a incredibly well designed bar with no other people, or a well designed bar with some people or a crappy bar where everybody hangs out? Yes pretty much everyone chooses the same answer. 3- Competition is important. Even though Japan has been known to be an insular society, Facebook succeeded in Japan but not in Russia. Facebook may claim that people adopt its platform because of its global appeal but in reality when local competitors have all the marketing options and all the basics (photo tagging, sharing, etc) people may not switch to Facebook. 4- It is not true that Japanese people don’t care about anonymity any more and Facebook’s success cannot be tied to its real name function. LINE picked up 40+ million users way faster than did Facebook and it certainly allows pseudonyms. 5- For any platform to cross the chasm, one age group should heavily adopt the platform. For Line, this was high school students and for Facebook, it seems like it was college students. 6- Disasters and major historical events (like the Arab Spring) do not necessarily have long term effects on usage numbers. As it can be seen in this Google Insights graph Ustream picked up after the earthquake dramatically but in the long run the efect faded away. 7- As also the graph shows that Facebook’s success has nothing to do with the quake. Additionally one should also remember that most of the people in the disaster hit area did not have a Facebook account when the disaster hit. Everett Rogers (2010) Diffusion of Innovations, 5th Edition. We recently conducted a survey among college students and found that LINE is their most favorite social media platform. Most interestingly when we asked what they would do if there was an earthquake, they listed LINE as their preferred type of communication channel after the phone, email and the internet. This is a topic I will discuss in my upcoming book Social Media and Japan. QUESTION: If there was an earthquake with the magnitude of 6.8 that hit this school and caused some minor damage (presume that you are safe and there’s no serious damage in your building). How would you use the new communication tools at that moment? Please rank these choices in terms of your priority. Your first choice should be listed as the 1st and your last choice should be ranked as the 7th. Score is a weighted calculation. Items ranked first are valued higher than the following ranks, the score is the sum of all weighted rank counts. – As Table 1 shows, the next most popular network among these people is Twitter and Mixi. Not a surprise here as Twitter is the biggest network and Mixi also has many social games. Also please remember that this data was collected 7 months ago, so the Facebook numbers also should be a little higher. – As table 2 shows, contrary to common view, these people don’t buy a lot of virtual goods. It is perhaps mostly otaku people or heavy users who spend their money to buy virtual goods or paid applications. – As Table 3 shows, these people have some artistic interests but they are not necessarily happy people or people with high self esteem. – I was already told by another professor that most of the core GREE and Mobage users were low income people who play games to kill time (e.g. truck drivers) and this is also reflected in the data. Social gamers have lower income levels compared with non-social gamers and the difference is statistically significant. The data was collected during the 2nd week of March, 2012 with the participation of 1000 members of an online panel operated by Kansai Electric Corporation in Japan. The members of this online panel are ordinary Japanese people who get points for each survey they take and they are given a chance to take a survey only in certain periods. The panel members who agreed to participate in the study were asked to complete an online self administered survey and there was no incomplete entries. 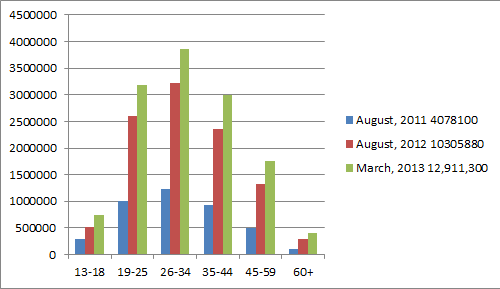 The age of the respondents varied between 19 to 65 years with the average of 42.88 (SD=9.30). All of the regions in Japan were equally represented in the sample and the participants had a wide range of occupational and educational backgrounds Although most of the respondents were male (67%) compared to most of the studies, this sample is larger and shows a higher variance in the sample characteristics. #1 HUMOR! When we asked “what kind of messages and photos do you usually like?” The majority of the open ended answers in the American sample included “funny ones” and “humorous messages”. There was almost zero reference to humor in the Japanese sample. #2 PROFILE PICTURE! When we asked what the respondents thought about Facebook accounts with no profile pictures, most of The American subjects stated that it was “creepy” and “strange.” On the contrary, most of the Japanese respondents thought this was normal and they would think the account owner has privacy concerns. #3 PARENTS! Facebook hasn’t been used by the older generation in Japan bu we asked how respondents would feel about friending their parents on Facebook. Almost all of the American subjects mentioned that they were already friends with their parents on Facebook. Strangely, most of the Japanese respondents indicated that they would definitely not want to be friends with their parents on Facebook since it would be very embarrassing. Japanese subjects also did not mention family members when explaining what kind of pictures they upload or what kind of messages they post while most of the American subjects did. #4 PROFESSORS! Two thirds of American students thought it was a bad idea to friend professors. On the other hand, two thirds of the Japanese students thought it was good. #5 RESPONDING! Perhaps the most important difference was the attitude toward responding to every single message on one’s Facebook wall. The question was “Do you usually respond to every single comment on your status or photos? (e.g. you post a photo and someone comments “you look nice in the picture” and you comment “thank you”) Why or why not? Most of the Americans said they don’t do this because “..they don’t comment just for the sake of commenting.” On the contrary almost all of the Japanese participants thought it is impolite to not to respond to every comment. It also looks like ignoring the person who left a comment. #6 SMART PHONE! Similarly, both American and Japanese subjects thought PC was more convenient than a smart phone when it comes to using Facebook. While nobody in the American sample showed a preference for smartphones, about a quarter of the Japanese participants thought smartphones were more convenient than computers to log on to Facebook. #7 UNTAG! Almost all of the American respondents reported untagging a picture of themselves whereas the majority of the Japanese respondents never untagged themselves. While some respondents in the US sample mentioned employment related concerns we suspect that Japanese users don’t untag themselves because they’re not tagged by others that often.